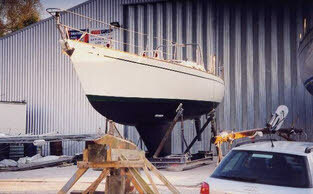 On 8 May 2001 “Al Shaheen” (still “Project 2000” at that stage) was hauled out of her build shed into the cool spring air at Universal Shipyard on the River Hamble. She was a few weeks behind schedule but not seriously late and we had not missed any glorious sailing weather. The mast was then stepped and rigging set up in spite of protestations from the riggers who quoted Health and Safety Regulations, insurance restrictions etc, in fact any excuse to avoid doing the rigging before the boat was afloat! However, we persevered and she was eventually launched, fully rigged, on a bright and sunny morning on18 May. The actual launch date had been so difficult to predict that I abandoned all hope of organizing a launching ceremony and settled for an official naming ceremony a week later on 25 May. Again, we had a beautifulyl sunny day with a light breeze and some 25 friends and guests attended while the designer’s wife, Pat Pocock, broke the customary champagne on a suitably protected and reinforced gunwhale and named her “Al Shaheen”. felt that an Arabic name would be appropriate as the funds used to finance the boat had resulted from working for 15 years in Saudi Arabia and, had I not done so, I would certainly not have been able to afford such an expensive project. “Shaheen” is the Arabic name for a female Peregrine Falcon, one of the fastest birds in the skies, which can approach 300 km/hour in a dive. 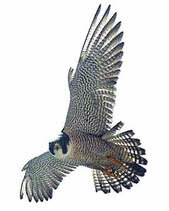 The name was chosen for its association with silent soaring flight and silent speed. Unfortunately, I found that “Shaheen” had already been taken on the British Register and the UK Registrar of Seaman and Shipping (Part 1) does not allow two ships of the same name. I therefore had to settle for “Al Shaheen”, “al” being the definite article in Arabic. Even at the official launch ceremony she was not 100% finished (no internal doors etc) so, after a few days sea trials in the Solent over a Bank Holiday weekend, during which Don Robinson and I found out how to handle her, she was handed back to the builder for completion. On 2 June Jill and, the late, Geoff, Eaton helped me sail her to Lymington for official sea trials the next day with the designer, Mike Pocock. These were carried out on the Solent on a bright summer’s day with a light northerly breeze. Al Shaheen behaved and performed well but we could have done with more wind for a real test. On 9 June John Ballard joined me to sail her to her summer quarters in Plymouth. Again, we had brilliant sunshine for this maiden voyage, but fairly light westerly and south westerly breezes. With alternate sailing and motoring we covered the 147 miles in 24 hours. On 1 July Don Robinson and I left Plymouth for a quick 15 day visit to southern Ireland to see if we could really test the boat in some strong winds and big seas. We picked up Allen Franklin in Falmouth and had a fast passage to Kinsale. From there we sailed to Dingle via Castletownsend, Bear Haven and Knightstown (Valentia). After weathering a severe gale in Dingle Marina we sailed back to Crookhaven and from there to the Scillies and thence to Plymouth. We had sailed some 650 miles and found that Al Shaheen sailed very fast in a good breeze, pointed well, handled very easily and behaved beautifully in a large sea. In fact, she was a delight to sail! The next adventure was a trip across the Bay of Biscay to join the OCC/RCC/CCA rally in Galicia organized by Alfredo Lagos. Don and I and Tony Brimble sailed her the 500 miles to Camarinas, in exactly 4 days. Not a fast trip but a very enjoyable one for Biscay. Thereafter we sailed her to Muros, where Tony departed, and then to Bayona where we joined the Rally, which really deserves a section on its own! We visited Islas Cies, Beluso, Villacarcia, Puebla de Caraminal (Ria Arousa), Muros, Ensenada de San Francisco and Portosin where we had the final dinner as guests of the Club Nautico de Portosin before leaving for the UK with John and Alex Ballard as crew. For our return trip we had mostly very light winds and poor visibility so we steered well to the west of the shipping, eventually arriving in Plymouth on 25 August. 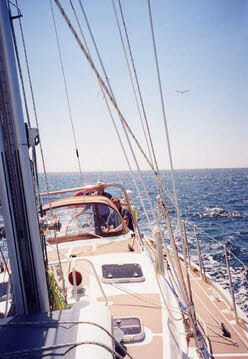 The 2001 season was rounded off with a week’s trip to Fowey and the Helford River with Susan Bennett, single-handed sailing out of Plymouth and a return to the Solent with son Richard in mid-October. On 31 October “Al Shaheen” was lifted out for the winter at Universal Shipyard, having completed 2,476 miles in her first season. During the winter her fore-and-aft trim was adjusted by cutting a hole in the aft keel, melting out 300 kg of lead, and replacing it with an equivalent amount of lead shot in empty compartments further forward. Other than that, there had not been found to be any significant design errors and she had proved to live up to her design specification admirably.